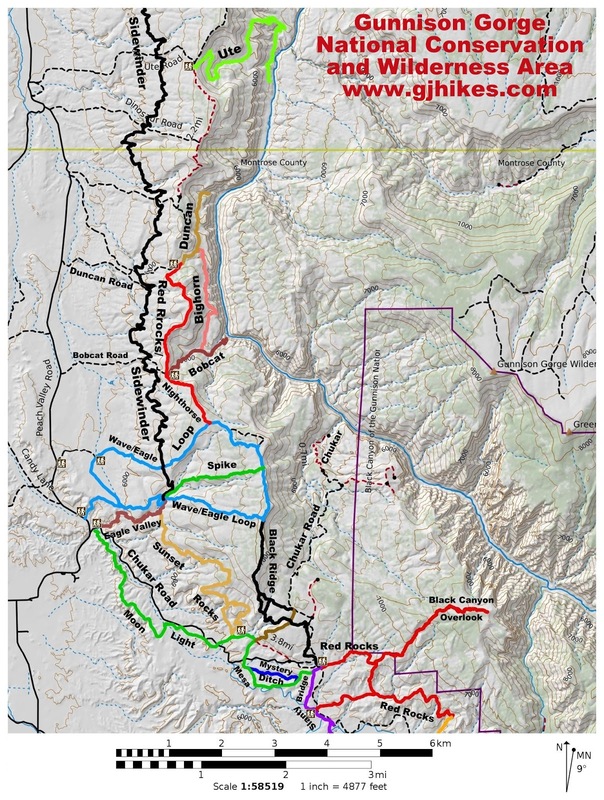 The Dinosaur Road is located in the Gunnison Gorge National Conservation Area near Delta, Colorado. 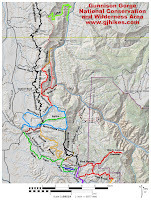 It begins off of the Peach Valley Road and climbs to the ridge overlooking the Gunnison River at a point downstream from Black Canyon National Park. At the top of the ridge the road is crossed by the Red Rocks/Nighthorse trail. 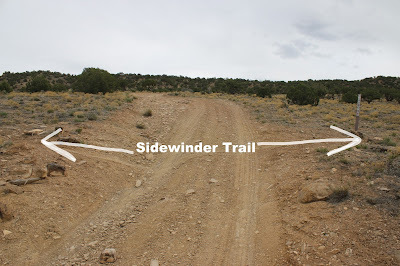 Near its midpoint it is crossed by the Sidewinder trail. At present finding where the Dinosaur Road departs from the Peach Valley Road isn't at all obvious. Currently there isn't a sign that says 'Dinosaur Road' although it is labeled as such on some maps. There are several routes that can be followed. One would be to drive south out of Delta on Highway 92 to Austin and then turn right onto 2200 Road. Follow it for a little over 2 miles and turn left onto F Road. After a short distance F Road becomes the Peach Valley Road. Continue as the road winds its way through the countryside measuring about 7 miles from the intersection of 2200 and F roads to the sign in this picture. It can be hard to tell exactly where the road is as it starts out but after a hundred yards or so it becomes more apparent. The road travels around an adobe hill where there is a marker that says 'Stay on Trail'. After that it climbs up a mound and the rest of the route becomes apparent as it can be seen stretching its way up to the ridge. The lower part of the road is probably suitable for 2-wheel drive vehicles with moderate clearance but it becomes much rougher as it progresses until eventually a high clearance 4-wheel drive vehicle is required. About halfway up the mountain the Dinosaur Road is crossed by the 20 mile long Sidewinder Trail. From that point on the road becomes much more rocky and steeper as it makes its final assault on the ridge. 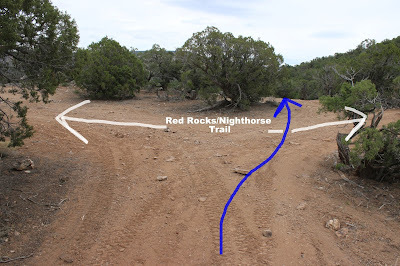 At the top of the ridge the Dinosaur Road is crossed by the Red Rocks/Nighthorse trail. 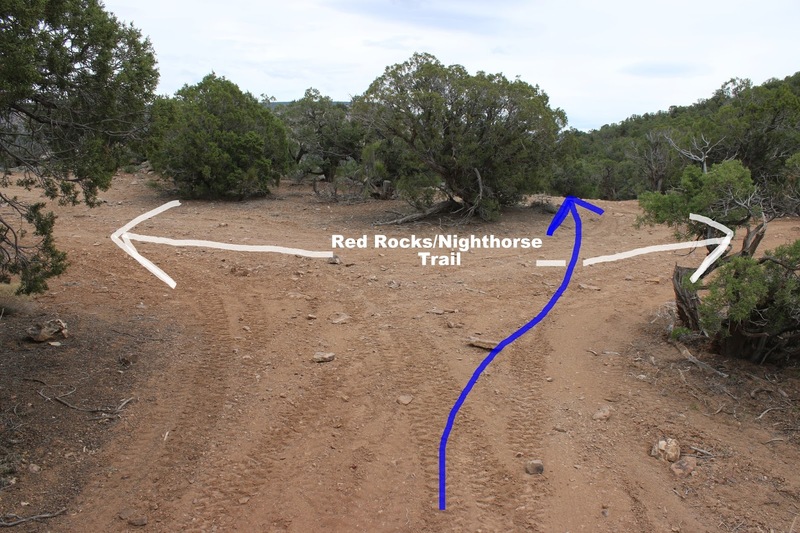 Red Rocks/Nighthorse is a jeep road from this point going northward to the left but going to the right it transitions into a singletrack that is open only to hiking, horseback, dirt bike and mountain biking. To get to the overlook you have to follow the road to the right to where the singletrack begins at which point the road jogs to the left and makes a short descent. From there the road begins climbing again and after a couple hundred yards it reaches the overlook. From the overlook there is a nice view of the Gunnison River as it courses its way through the gorge below. We aren't quite sure exactly how the Dinosaur Road received its name. We do know that there are some unique dinosaur tracks in the area and while we were mountain biking the Sidewinder trail we did see some fossils and both partial and full crocodile and theropod tracks. 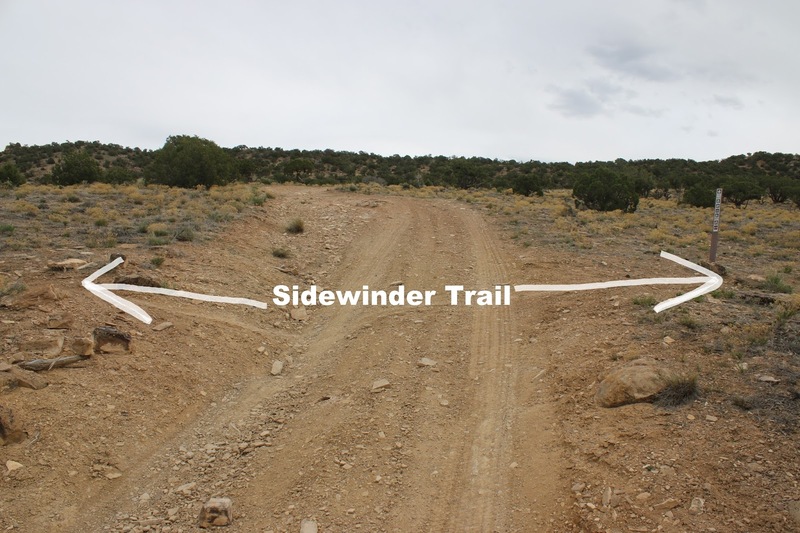 Besides whatever paleontological reasons for the Dinosaur Road it also serves as an important connector for OHV enthusiasts using the Nighthorse trail and for mountain bikers that want to divide up the 20 mile long Sidewinder trail into more manageable chunks. If you would like to see it for yourself then all you have to do is 'Take a hike'.